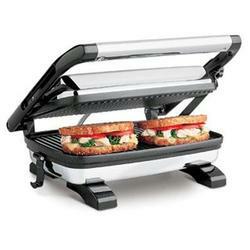 Serve up a mouth-watering sandwich from this panini grill! Select a Hamilton Beach Gourmet Panini Press to cook a variety of delicious, healthy sandwiches for family and friends. Try different flavored breads with your favorite fillings, or experiment with new combinations! Nonstick grids Offer easy removal of sandwich bread from panini press grill without sticking and easy wiping clean after use. Floating lid Permits creating any thickness of sandwich to grill and locks for upright space saving storage. Power and preheat lights Let you know when panini maker is ready to have sandwiches placed on it. Included recipes Give you a heads up on choosing breads and ingredients to make delicious meals for the family.